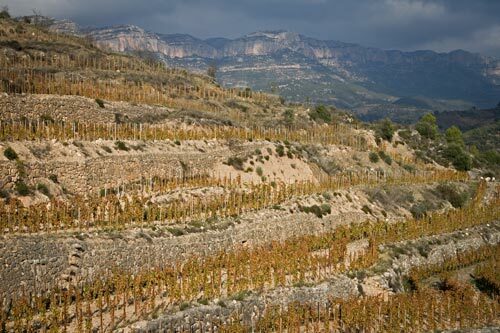 It was one of those days (of which there were many) wherein it was threatening to rain when we went to visit Bodega Mas Alta for the Priorat guide. This building wouldn’t look out of place in Bordeaux as a chateau and it’s not a surprise that it’s a team from France taking care of it for the French Belgian owners. Good group of people who, upon our arrival quickly whisked us up to their old terraces. There, the last rays of sunlight was glinting on the old stone walls while dark thunderheads loomed over the Montsant massif. Unlike other wineries in the region, Mas Alta chose not to demolish the old stones and work within them. Those who demolish do so because no kind of vehicles can pass the vines during harvest and everything has to not only be picked by hand, but also carried out by hand. Besides their preserving history, they also preserved a feature that we quite love in these old terraces which you can see in the lower left of the photo above. Those are the large stone slabs people would embed in the wall to function as steps from one terrace to another. Quite cool really and while you come across them here and there in Priorat, the only other place we’ve readily seen them was at the Malajambota vineyards in Cap de Creus, Empordà. Ultimately, our visit proceeded without a drop of rain to be found and on the way out, the parting clouds framed the sunset just right for one of our best winery profile photos we were able to take.